Run file compare utility fc to compare test file with saved file and store differences in dif directory in file with same name. Run linklib\RTGENDIF.MLC utility to check each FC compare DIF file and generate ERASE command file to delete all the exact matches and then generate 2 file entries named RT_DIF_TOT_FILES_NNNN and RT_DIF_MATCH_NNNN showing the total files and total matches found. Sort the dif directory files in descending order by size and list them to see which files have the largest differences. (The differences may be due to different user directories, different z390 versions, different operating systems or Java runtimes, or execution errors. RT - run all of the non-interactive regression tests including RTMVS and RTTEST (For v1.4.03 this regression test found 2309 files and 2303 matching files. The 6 file differences were expected due to time and date tests. DEMOSTR1 Demo use of structured programming macros - IF, ELSEIF, ELSE, ENDIF, DO, and ENDDO. 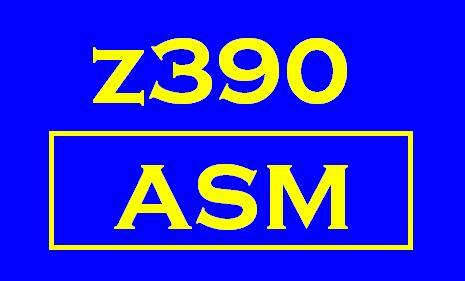 See z390 Structured Programming Guide. See SHARE presentation by Ed Jaffee. DEMOGUI6 GUAM interactive TN3270 screen demo with F1 help and 3 input fields - name, address, and zip. The zip field is numeric and alarm sounds if alpha entered. HELLO1 demo TN3270 TPUT FULLSCR "Hello World"
FPCONVRT callable floating point conversion routine contributed by David Bond with Tachyon called by FPCONMFC when using LINKAGE=MF for mainframe compatiblity on CTD and CFD conversion macros in z390 assembler. TESTFPC1 verify CTD and CFD conversion for range of floating point values using both MF and SVC linkage options for EB, EH, DB, DH, LB, and LH floating point types. TESTFPC2 verify CTD and CFD conversions for MIN and MAX values for all floating point types including EB, EH, DB, DH, LB, and LH. DEMOMAIN Main program which calls DEMOSUB1 and DEMOSUB2 to add 2 numbers. This demo is first run using static linking of subroutines and then it is rebuilt using generated stub object code to interface with client manager DEMOCMGR which uses TCPIO svc to communicate via sockets over TCP/IP network with DEMOSMGR which calls the requested dynamically loaded subroutine modules on the server to perform the requested service and return results. TESTMSGC Send message to TESTMSGS server on specified port. Message is echoed back to TESTMSGC and displayed on console. Enter Q to end. TESTMSGS Receive message from SOA client and send it back. TESTCIC1 mz390 test of DFTRESP CICS error code literal substitution. TESTIPL2 ez390 test option IPL(TESTIPL1) which executes TESTIPL1 before TESTIPL2 which then fetches CVTDATE and displays its current value which is 0 if TESTIPL1 is not run first to initialize it. TESTPRM4 mz390 test double quotes around SYSPARM with commas "SYSPARM('A,B')"
TESTPRO1 mz390 test PROFILE(TESTPRO1) copy file included preceeding MLC source which executes macro TESTPROS.MAC and redefines END opcode to execute TESTPROT.MAC at termination. SUPERZAP Utility to search, verify, dump, and path any file up to 2 GB. UNREF Utility to read any PRN z390 assembly listing and list unreferened symbols. ESF1SG Use VSAM application macros to read ESF1 ESDS VSAM file created by ESF1SP. ESV1SG Use VSAM application macros to read ESV1 ESDS VSAM file and verify the content of the records which vary from 1 to 100,000 in lenght by powers of 10. ESV1SP Use VSAM application macros to create ESV1 ESDS VSAM file with variable length records up to 100,000 in length. DEMOVSE2 Load and call DEMOVSE1 using CDLOAD and CDDELETE and then exit using EOJ VSE macro. DEMOVSE3 Read and write records using OPEN, CLOSE, GET, PUT, DTFCD, and DTFPR macros. Note the MVS 3.8 regression tests currently just validate assemble and link only. Most MVS 3.8 macros generate svc interface code that is not compatible with z390 or any other operating system version. The hello world demo can be executed because the common WTO svc 35 interface is compatible with z390. To execute application programs using z390, will require either using the z390 default macros available or writing user svc handler to map the MVS svc interface to be compatible with the currently supported z390 svc interfaces. See z390 regression test RT\TEST\TESTSVC1 for example of simple svc hander. For additional demos in HLASM, ASM, C++, COBOL, and Java for comparison visit www.mfatc.org. DEMO Assemble, link, and execute a 'HELLO WORLD' demo using MVS 3.8 WTO macro and SVC 35 which is compatible at the svc interface. TESTCVTX Stub assembly to resolve all the EXTRN's in CVT. TESTFIX1 mz390 conditional macro code utility used to edit all the MVS\MACLIB macros.